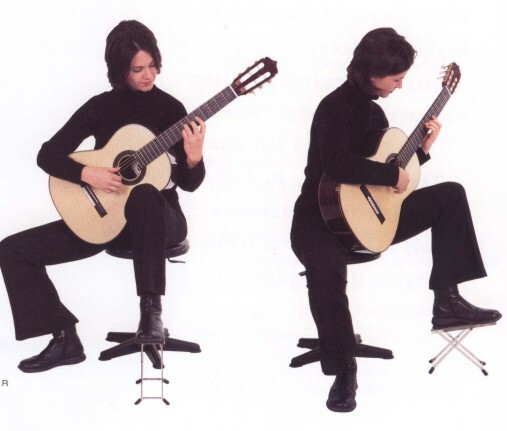 How to hold a guitar seems basic but it is widely accepted that if you are going to play a classical guitar properly, then how you hold your instrument is of the utmost importance. I have numerous quality guitar instruction books on the subject, and they ALL say virtually the same thing, with only slight modifications of opinion. I always tell my students, when discussing holding a guitar to sit towards the front of the chair, though they must be comfortable. Using a footstool to raise their left leg allows the student a very good position to observe what their left hand is doing. The guitar itself is rested on the left leg (assuming you're playing right-handed) at its waist, and the end of the guitar is held steady by your right leg. The end of the head stock should be at eye level, and the guitar is slightly tilted back towards your chest. If you then rest your right arm on the lower bout, it's a perfect position to play the strings with your right hand. It is also then in line with the bridge. Another important point to remember is to keep a slight arch in your right forearm so that you can depress the strings properly. I've noticed that when students flatten out their forearm, they tend to pull the strings out to gain volume and in the process cause a horrible "thwacking" sound from their instrument. The arch in the forearm tends to alleviate this problem although you don't want to arch your forearm and wrist too much as it can cause problems later down the track with "carpal tunnel syndrome" and other awfully painful problems... 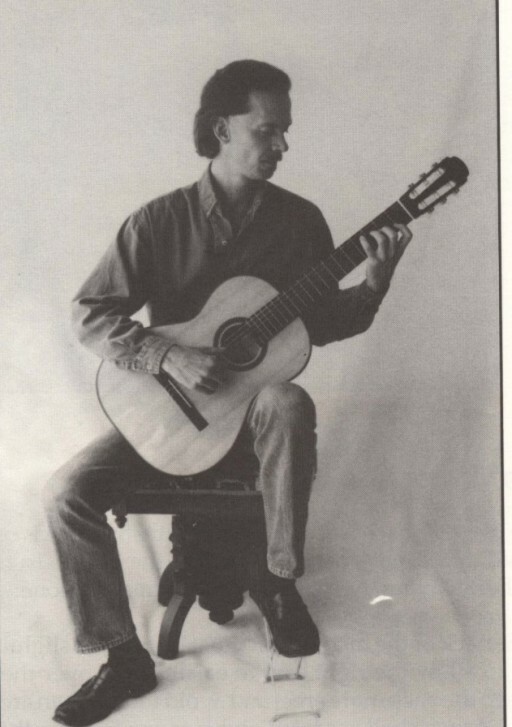 If you look at what David Braid has included in his book, Play Classical Guitar, and Anthony Glise says in his book, Classical Guitar Pedagogy, the import of the information is much the same. When the left hand is used to hold the neck as you're playing notes, the guitar has five contact points with your body, which helps to keep it very still and secure, whilst playing. 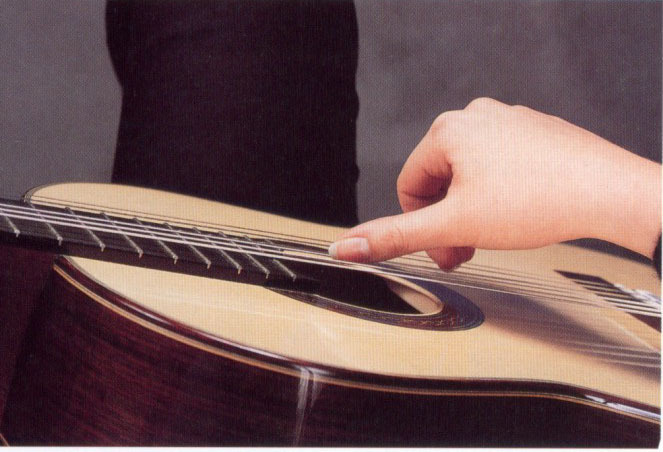 The left hand can easily and securely move around the fingerboard. 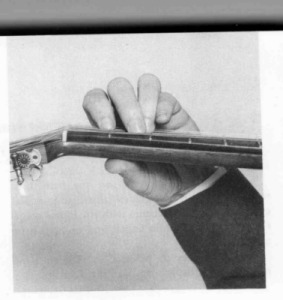 When thinking about how to hold a guitar remember to stay relaxed. This will allow your music to flow from the sound hole. You can always see a tense guitarist as their shoulders are always too high, which often means they play with a particularly noticeable "strangled" sound. If you look at the above photos and follow these points I've mentioned, it should be easy to master how to hold a guitar.